There’s no doubt about it, we love a Ford Transit here at Anchor Vans and we know the country does too. A British icon in the world of business transport, did you know that this tireless workhorse has been around for well over 50 years? Keeping electricians, plumbers and builders on the road day after day, year after year, the Transit sure is a favourite in the UK. In its lifetime more than 8 million units have been produced and sold worldwide, and sales continue to increase year on year. Are there no bounds to the Transit’s covetable success? The very first Transit cost £542 and rolled out of the factory and on to our roads in 1965. 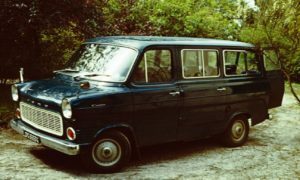 Replacing Ford of Britain’s Thames 400E, the new Transit was a wider, more versatile vehicle and as such it invited negative views from some critics who said it would be too wide for many British driveways. Whether or not it was too wide for our driveways however, the spaciousness of the American-inspired cargo vehicle helped the Transit to drive off the main competition of the narrower Bedford CA and establish itself at the top of the UK commercial vehicle market. Here the self-proclaimed ‘backbone of Britain’ would firmly take up its lengthy reign. But the Transit unwittingly developed a dark side. 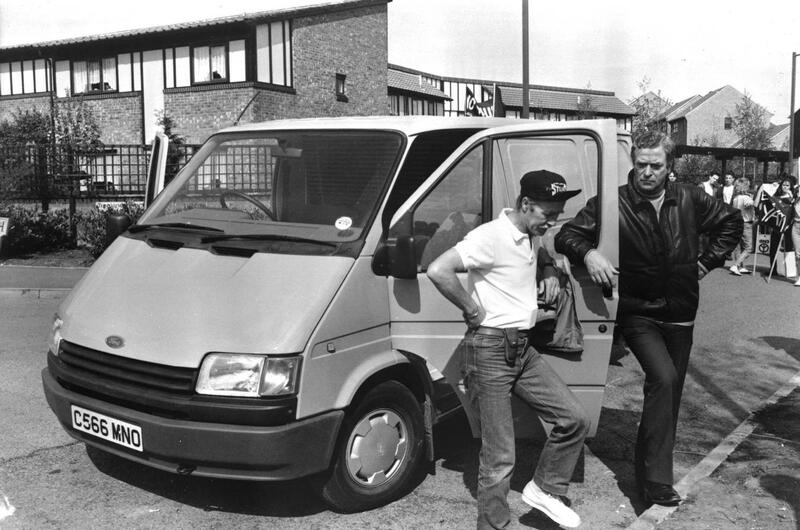 With its roomier load space and faster engine the Transit van won the attention of an unlikely operator. In 1972 the Metropolitan Police reported that Ford Transits were used in 95 per cent of bank raids. Offering the performance of a car, anonymity on the roads amongst the hordes of Transits and space for 1.75 tonnes of loot, it proved to be the perfect getaway vehicle. Dodgy past aside, since its introduction in the UK in 1965 the Transit has conquered the LCV market in every continent. 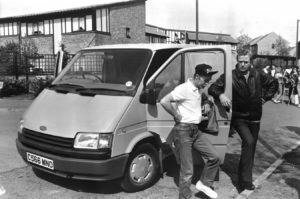 The Transit was originally built in Langley, Berkshire at a manufacturing plant that previously made Hawker-Hurricane fighter aircraft, and not far from us here at Anchor Vans. Production moved to Southampton in the early 1970s as demand outgrew the Berkshire plant’s capabilities. 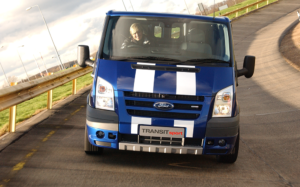 The Transit has also been manufactured in Belgium, The Netherlands (for a short time), China and Turkey. Sadly after nearly 50 years of UK production the Hampshire-based factory closed, and European/Asian production of the British icon moved to its permanent home of Kocaeli in Turkey, in favour of lower production costs. Originally designed for the European market, the Transit van is now manufactured in Asia, North America and Europe for sale all around the world. In its lifetime it has consistently been the top selling van in Europe and the UK and more recently the Transit has extended its popularity to both the Chinese and US markets where it has been the best-selling van since 2016. The most popular LCV family in the world, the Transit van continues to go from strength to strength. So what keeps the Transit at the top of the market year after year? Where to begin! The vast range of body style and configuration options, easily sourced and long lasting mechanical components, the wide chassis, all of these contribute to the success of the Transit. Cargo, passenger, pick up and flatbed, short-wheel base, long-wheel base, rear wheel drive, front wheel drive, even four wheel drive, the Transit family is super-versatile. With impressive driveability, especially since the introduction of the third generation in 2000, recent models of the Transit offer car-like performance. Many will remember German racing driver, Sabine Schmitz, hurtling around the Nürburgring in a Transit on Top Gear in 2005. Attempting to beat Jeremy Clarkson’s lap time of 10 minutes in a Jaguar sports saloon, and coming in just eight seconds behind. The traditional two box design with a short bonnet for the engine. Early Transits used shorter V4 engines which required less bonnet length, although diesel vehicles needed a longer bonnet. A move to the modern ‘one-box’ design with the sharply-sloping nose from windscreen to bonnet. Engine upgrades, improved handling due to new suspension design and the introduction of optional luxury features such as air conditioning and central locking. Designed by Ford US, the addition of some major engine upgrades, including Duratorq turbo-diesel, and genuinely car-like performance. 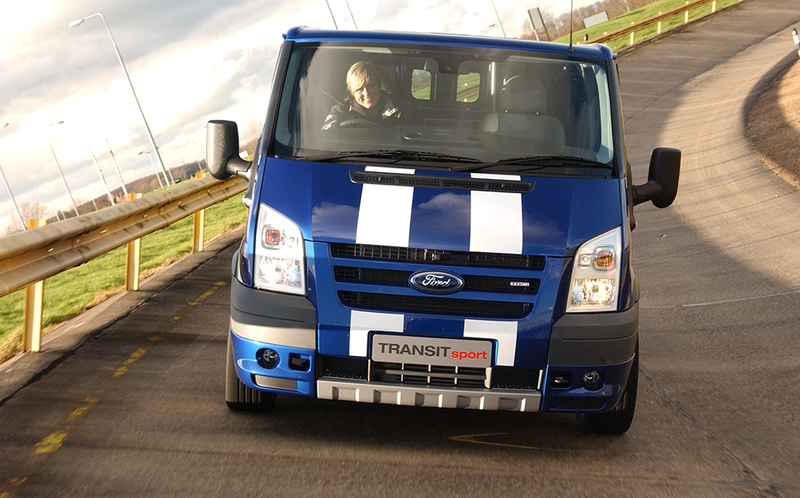 The Transit became available in both rear-wheel and front-wheel drive. A OneFord vehicle by Ford Europe co-developed with Ford US. Two versions: a mid-size front-wheel drive (Transit/Tourneo Custom), and a full-size rear-wheel drive for the North American market. European vehicles stayed similar to previous models, but US models are larger with more powerful engines, including a 3.7 litre 275hp V6 and an optional 3.5-litre 350hp EcoBoost V6. The life expectancy of some Transit van parts is 250,000 miles. Prior to the introduction of countrywide speed limits, Ford engineers carried out night time sustained high speed testing of Transits on Essex roads. The local police became so used to seeing these high speed tests that they often stopped them to enquire on progress. It is the archetypal white van, but do you actually know why most vans are white? There are two reasons, one is the expectation that white paint ensures the vehicle stays cooler in the sun, but let’s be honest the key reason is the simple fact that white paint is cheaper. Making its first appearance at Brands Hatch in 1971, the first Ford Transit Supervan. Based on a Ford GT4O and powered by a 5 litre V8 engine, the Supervan could reach a top speed of 149 mph. Transit vans have the Roadie transport of choice for Elton John, the Small Faces and Wet Wet Wet to name a few. Making an action appearance alongside Michael Caine in The Fourth Protocol, 1982, the Transit 1.6 MkII. Who says the Transit van isn’t glamorous?